Represent the declaration of a variable (in which case it is an lvalue) a function (in which case it is a function designator) or an enum constant. Definition at line 636 of file Decl.h. Definition at line 642 of file Decl.h. Definition at line 655 of file Decl.h. Definition at line 656 of file Decl.h. Definition at line 647 of file Decl.h. Referenced by clang::Sema::ActOnCXXDelete(), clang::Sema::ActOnFinishCXXInClassMemberInitializer(), clang::Sema::ActOnForEachDeclStmt(), clang::Sema::ActOnInitializerError(), clang::Sema::ActOnObjCForCollectionStmt(), clang::Sema::ActOnOpenMPAlignedClause(), clang::Sema::ActOnOpenMPCopyprivateClause(), clang::Sema::ActOnOpenMPDeclareSimdDirective(), clang::Sema::ActOnOpenMPFirstprivateClause(), clang::Sema::ActOnOpenMPIsDevicePtrClause(), clang::Sema::ActOnOpenMPLastprivateClause(), clang::Sema::ActOnOpenMPLinearClause(), clang::Sema::ActOnOpenMPPrivateClause(), clang::Sema::ActOnOpenMPUseDevicePtrClause(), AddFunctionParameterChunks(), AddFunctionTypeQualsToCompletionString(), clang::Sema::AddInitializerToDecl(), clang::CodeGen::CodeGenFunction::AddInitializerToStaticVarDecl(), clang::Sema::AddMethodCandidate(), clang::Sema::AddOverloadCandidate(), clang::ASTContext::adjustDeducedFunctionResultType(), clang::Sema::AdjustDestructorExceptionSpec(), clang::ASTContext::adjustExceptionSpec(), clang::CodeGen::CGOpenMPRuntimeNVPTX::adjustTargetSpecificDataForLambdas(), AnalyzeBitFieldAssignment(), clang::CodeGen::CodeGenTypes::arrangeFunctionDeclaration(), clang::CodeGen::CodeGenTypes::arrangeObjCMethodDeclaration(), assumeNoOverflow(), AuditedType(), clang::Sema::BuildAnonymousStructUnionMemberReference(), buildByrefHelpers(), buildCapture(), clang::Sema::BuildDeclarationNameExpr(), clang::Sema::BuildDeclaratorGroup(), buildDeclareReductionRef(), BuildImplicitBaseInitializer(), BuildImplicitMemberInitializer(), clang::Sema::BuildMemberInitializer(), buildUserDefinedMapperRef(), clang::Sema::ImplicitExceptionSpecification::CalledDecl(), clang::CapturedStmt::Capture::Capture(), clang::Sema::checkAllowedCUDAInitializer(), CheckASTMemory(), clang::ento::retaincountchecker::RetainCountChecker::checkBeginFunction(), clang::Sema::CheckCompleteDecompositionDeclaration(), clang::Sema::CheckCompleteVariableDeclaration(), clang::Sema::CheckConditionVariable(), CheckConstantExpression(), CheckConstexprCtorInitializer(), CheckConstexprParameterTypes(), clang::Sema::CheckConstructor(), clang::Sema::CheckConstructorAccess(), clang::Sema::CheckEquivalentExceptionSpec(), checkEscapingByref(), clang::Sema::CheckExplicitlyDefaultedSpecialMember(), CheckFallThroughForBody(), clang::Sema::CheckFunctionTemplateSpecialization(), CheckICE(), CheckIdentityFieldAssignment(), clang::Sema::checkIllFormedTrivialABIStruct(), clang::Sema::CheckImplementationIvars(), clang::Sema::checkInitializerLifetime(), clang::Sema::CheckLiteralOperatorDeclaration(), checkLiteralOperatorTemplateParameterList(), clang::Sema::CheckMain(), CheckMoveOnConstruction(), clang::Sema::CheckMSVCRTEntryPoint(), CheckNonNullArguments(), clang::Sema::CheckNontrivialField(), CheckNonTypeTemplatePartialSpecializationArgs(), checkOpenMPLoop(), CheckOperatorNewDeleteTypes(), clang::Sema::CheckOverload(), clang::Sema::CheckOverloadedOperatorDeclaration(), clang::Sema::CheckOverrideControl(), clang::Sema::CheckOverridingFunctionAttributes(), clang::Sema::CheckOverridingFunctionExceptionSpec(), clang::Sema::CheckOverridingFunctionReturnType(), checkSelfIvarsForInvariantViolation(), CheckTemplateArgumentAddressOfObjectOrFunction(), CheckTemplateArgumentPointerToMember(), checkTupleLikeDecomposition(), checkValueDeclInTarget(), clang::Sema::CheckVariableDeclarationType(), checkVAStartABI(), ClassifyDiagnostic(), clang::Sema::CodeCompleteInitializer(), CollectFieldInitializer(), commonEmitCXXMemberOrOperatorCall(), clang::Sema::CompleteConstructorCall(), completeFunctionType(), clang::CodeGen::CGDebugInfo::completeUnusedClass(), computeBlockInfo(), considerVariable(), clang::Sema::containsUnexpandedParameterPacks(), clang::CodeGen::convertFreeFunctionType(), CopyObject(), clang::CXXDefaultInitExpr::Create(), create_dispatch_once(), create_dispatch_sync(), create_OSAtomicCompareAndSwap(), createBinOpInfoFromIncDec(), clang::ento::ExprEngine::CreateCXXTemporaryObject(), clang::CodeGen::CodeGenModule::CreateFunctionTypeMetadataForIcall(), createObjCPropertyGetter(), createPrivatesRecordDecl(), decomposeTypeForEH(), DeduceNonTypeTemplateArgument(), clang::Sema::DeduceReturnType(), clang::Sema::DeduceTemplateArguments(), clang::Sema::DeduceVariableDeclarationType(), clang::Sema::DefineImplicitCopyAssignment(), clang::Sema::DefineImplicitCopyConstructor(), clang::Sema::DefineImplicitDefaultConstructor(), clang::Sema::DefineImplicitDestructor(), clang::Sema::DefineImplicitMoveAssignment(), clang::Sema::DefineImplicitMoveConstructor(), clang::Sema::DefineInheritingConstructor(), dereference(), DereferenceInfo::DereferenceInfo(), describeCall(), describeUninitializedArgumentInCall(), clang::Sema::DiagnoseAutoDeductionFailure(), DiagnoseForRangeConstVariableCopies(), DiagnoseForRangeReferenceVariableCopies(), DiagnoseForRangeVariableCopies(), DiagnoseSelfAssignment(), diagnoseTautologicalComparison(), clang::Sema::diagnoseUnavailableAlignedAllocation(), DiagnoseUninitializedUse(), diagReturnOnAllocFailure(), DoMarkVarDeclReferenced(), DumpRecordLayout(), clang::CodeGen::CodeGenFunction::EmitAndRegisterVariableArrayDimensions(), emitArgumentDemotion(), clang::CodeGen::CodeGenFunction::EmitAsanPrologueOrEpilogue(), clang::CodeGen::CodeGenFunction::EmitAutoVarAlloca(), clang::CodeGen::CodeGenFunction::EmitAutoVarCleanups(), clang::CodeGen::CodeGenFunction::EmitAutoVarInit(), clang::CodeGen::CodeGenFunction::emitAutoVarTypeCleanup(), EmitAutoVarWithLifetime(), clang::CodeGen::CGOpenMPRuntime::emitCall(), clang::CodeGen::CodeGenFunction::EmitCallAndReturnForThunk(), emitCombinerOrInitializer(), clang::CodeGen::CodeGenFunction::EmitConstructorBody(), emitCopyprivateCopyFunction(), emitCPPObjectAtomicSetterCall(), clang::CodeGen::CodeGenFunction::EmitCXXConstructorCall(), clang::CodeGen::CodeGenFunction::EmitCXXGlobalVarDeclInit(), clang::CodeGen::CodeGenFunction::EmitCXXMemberOrOperatorCall(), clang::CodeGen::CodeGenFunction::EmitCXXNewExpr(), clang::CodeGen::CGDebugInfo::EmitDeclareOfBlockDeclRefVariable(), clang::CodeGen::CGDebugInfo::EmitDeclareOfBlockLiteralArgVariable(), clang::CodeGen::emitDeclareTargetVarDefinition(), EmitDeclDestroy(), EmitDeclInit(), EmitDeclInvariant(), emitDeclTargetLinkVarDeclLValue(), clang::CodeGen::CodeGenFunction::EmitDelegateCallArg(), clang::CodeGen::CodeGenFunction::EmitDeleteCall(), clang::CodeGen::CodeGenFunction::EmitEndEHSpec(), clang::CodeGen::CodeGenFunction::EmitExprAsInit(), clang::CodeGen::CodeGenFunction::EmitForwardingCallToLambda(), EmitFunctionDeclPointer(), EmitGlobalNamedRegister(), EmitGlobalVarDeclLValue(), clang::CodeGen::CGDebugInfo::EmitGlobalVariable(), clang::CodeGen::CodeGenFunction::emitImplicitAssignmentOperatorBody(), clang::CodeGen::CodeGenFunction::EmitInitializerForField(), clang::CodeGen::CGObjCRuntime::EmitInitOfCatchParam(), clang::CodeGen::CodeGenFunction::EmitLambdaBlockInvokeBody(), clang::CodeGen::CodeGenFunction::EmitLValueForField(), clang::CodeGen::CodeGenFunction::EmitLValueForFieldInitialization(), clang::CodeGen::CGCXXABI::EmitMemberFunctionPointer(), EmitNullConstant(), clang::CodeGen::CodeGenFunction::EmitNVPTXDevicePrintfCallExpr(), clang::CodeGen::CodeGenFunction::EmitObjCBoxedExpr(), clang::CodeGen::CodeGenFunction::EmitOMPCopyinClause(), clang::CodeGen::CodeGenFunction::EmitOMPFirstprivateClause(), clang::CodeGen::CodeGenFunction::EmitOMPLinearClauseInit(), emitOutlinedFunctionPrologue(), emitParallelOrTeamsOutlinedFunction(), clang::CodeGen::CodeGenFunction::EmitParmDecl(), emitReplacement(), clang::CodeGen::CodeGenFunction::EmitRValueForField(), clang::CodeGen::CodeGenFunction::EmitStartEHSpec(), clang::CodeGen::CodeGenFunction::EmitStaticVarDecl(), emitStructSetterCall(), clang::CodeGen::CodeGenFunction::EmitSynthesizedCXXCopyCtorCall(), emitTaskPrivateMappingFunction(), clang::CodeGen::emitThreadPrivateVarInit(), clang::CodeGen::emitUserDefinedReduction(), clang::CodeGen::CGDebugInfo::EmitUsingDecl(), clang::CodeGen::CodeGenFunction::EmitVarDecl(), clang::Sema::EndOpenMPDSABlock(), clang::CodeGen::CodeGenFunction::EnterDtorCleanups(), clang::Expr::EvaluateAsInitializer(), evaluateCDTSize(), EvaluateComparisonBinaryOperator(), clang::Sema::EvaluateImplicitExceptionSpec(), EvaluateLValue(), evaluateLValueAsAllocSize(), EvaluateUnaryTypeTrait(), EvaluateVarDecl(), clang::exceptionSpecNotKnownYet(), FieldHasTrivialDestructorBody(), clang::Sema::FinalizeVarWithDestructor(), findCompleteObject(), findRetainCycleOwner(), clang::ento::FindUninitializedFields::FindUninitializedFields(), FinishForRangeVarDecl(), clang::ASTContext::forEachMultiversionedFunctionVersion(), FormatFunctionParameter(), clang::CodeGen::CodeGenFunction::GenerateObjCAtomicSetterCopyHelperFunction(), clang::CodeGen::CodeGenFunction::generateObjCGetterBody(), clang::CodeGen::CodeGenFunction::generateObjCSetterBody(), clang::CodeGen::CodeGenFunction::GenerateVarArgsThunk(), getAccessFlag(), clang::CodeGen::CGOpenMPRuntimeNVPTX::getAddressOfLocalVariable(), clang::CodeGen::getAddrOfDeclareTargetLink(), clang::CodeGen::CodeGenModule::GetAddrOfFunction(), clang::CodeGen::CodeGenModule::GetAddrOfGlobalVar(), clang::ento::CallEvent::getASTArgumentIndex(), clang::CodeGen::CodeGenFunction::getBlockByrefInfo(), getBlockCaptureStr(), getBlockLayoutInfoString(), getCallingConvMangling(), getCaptureFieldType(), clang::CXXCatchStmt::getCaughtType(), getContainedDynamicClass(), getDecltypeForExpr(), clang::CFGImplicitDtor::getDestructorDecl(), clang::CXXMethodDecl::getDevirtualizedMethod(), getExistingLazyBinding(), GetFormalType(), clang::CodeGen::CodeGenTypes::GetFunctionTypeForVTable(), GetGCAttrTypeForType(), clang::CodeGen::TargetCodeGenInfo::getGlobalVarAddressSpace(), clang::CodeGen::CodeGenModule::GetGlobalVarAddressSpace(), getIncrementedVar(), clang::ento::ExprEngine::getInitialState(), getMaxAtomicAccessSize(), getNDSWDS(), clang::FunctionDecl::getNumParams(), getObjectType(), clang::Sema::getOpenMPCapturedExpr(), clang::ParmVarDecl::getOriginalType(), clang::CodeGen::CGOpenMPRuntimeNVPTX::getParameterAddress(), getReturnTypeForMethod(), clang::BlockCall::getRuntimeDefinition(), getSelfInitExpr(), GetSignature(), getStaticBooleanValue(), getThreadLocalWrapperLinkage(), GetTypeOfFunction(), getUsualDeleteParams(), clang::ento::MemRegionManager::getVarRegion(), clang::CodeGen::CodeGenModule::GetWeakRefReference(), HandleConstructorCall(), clang::CodeGen::CodeGenModule::HandleCXXStaticMemberVarInstantiation(), hasCopyOrMoveCtorParam(), hasDeducedAuto(), hasDefaultCXXMethodCC(), hasDependentAlignment(), HasNoThrowOperator(), clang::ComparisonCategoryInfo::ValueInfo::hasValidIntValue(), identifyCall(), clang::if(), clang::CodeGen::CodeGenModule::imbueXRayAttrs(), clang::Sema::inferObjCARCLifetime(), InitCatchParam(), clang::TemplateDeclInstantiator::InitFunctionInstantiation(), InitializationHasSideEffects(), clang::Sema::InstantiateExceptionSpec(), clang::FieldDecl::isAnonymousStructOrUnion(), isAtLeastAsSpecializedAs(), clang::CodeGen::CodeGenFunction::IsConstructorDelegationValid(), clang::Sema::isCopyElisionCandidate(), clang::CXXConstructorDecl::isCopyOrMoveConstructor(), clang::FunctionDecl::isDestroyingOperatorDelete(), isDispatchBlock(), isEmptyField(), llvm::DenseMapInfo< DecompositionDeclName >::isEqual(), clang::Sema::isExternalWithNoLinkageType(), isFunctionLocalClass(), isImplicitThis(), clang::Sema::isInitListConstructor(), clang::VarDecl::isKnownToBeDefined(), isLayoutCompatible(), clang::ASTContext::isMSStaticDataMemberInlineDefinition(), isNoexcept(), isNonPlacementDeallocationFunction(), clang::FunctionDecl::isNoReturn(), clang::Sema::isOpenMPCapturedByRef(), isOSObjectRelated(), clang::ParmVarDecl::isParameterPack(), isPreferredLookupResult(), clang::ASTContext::isPromotableBitField(), isReferenceToNonConstCapture(), clang::FunctionDecl::isReplaceableGlobalAllocationFunction(), clang::FunctionDecl::isReservedGlobalPlacementOperator(), IsStandardConversion(), isStreamCharSpecialization(), isTemplate(), isTrackedVar(), clang::CodeGen::CodeGenModule::isTypeConstant(), clang::VarDecl::isUsableInConstantExpressions(), IsValidIdentifier(), isVarDeclStrongDefinition(), clang::FunctionDecl::isVariadic(), isZeroSized(), clang::CodeGen::CodeGenFunction::LoadObjCSelf(), LookThroughTransitiveAssignmentsAndCommaOperators(), LookupDirect(), LookupMemberExpr(), clang::MangleContext::mangleName(), mangleThunkThisAdjustment(), clang::Sema::MarkDeducedTemplateParameters(), markEscapingByrefs(), clang::Sema::MarkFunctionReferenced(), MarkUsedTemplateParameters(), MatchTemplateParameterKind(), maybeRecoverWithZeroInitialization(), clang::CodeGen::CodeGenModule::maybeSetTrivialComdat(), clang::Sema::MergeVarDeclTypes(), clang::Sema::NoteHiddenVirtualMethods(), clang::Sema::NoteOverloadCandidate(), clang::ASTContext::ObjCMethodsAreEqual(), clang::ObjCMethodDecl::GetTypeFn::operator()(), parseOpenMPReductionId(), clang::InitializationSequence::Perform(), clang::Sema::PerformCopyInitialization(), clang::Sema::PerformImplicitConversion(), clang::Sema::PerformMoveOrCopyInitialization(), PopulateKeysForFields(), print_elem(), clang::ento::ExprEngine::ProcessAutomaticObjDtor(), clang::ento::ExprEngine::ProcessInitializer(), clang::ento::ExprEngine::ProcessMemberDtor(), clang::TreeTransform< Derived >::RebuildCXXPseudoDestructorExpr(), RefersToRValueRef(), clang::CodeGen::registerTargetFirstprivateCopy(), clang::CodeGen::registerTargetGlobalVariable(), clang::CodeGen::SanitizerMetadata::reportGlobalToASan(), reportOriginalDsa(), requiresAMDGPUProtectedVisibility(), resolveBuiltinNewDeleteOverload(), clang::Sema::ResolveExceptionSpec(), rewriteToObjCProperty(), roundUpSizeToCharAlignment(), scanToNextArgument(), clang::CodeGen::CodeGenFunction::setBlockContextParameter(), setImpliedPropertyAttributeForReadOnlyProperty(), clang::Sema::setOpenMPCaptureKind(), clang::Sema::SetParamDefaultArgument(), clang::CodeGen::CodeGenFunction::OMPMapVars::setVarAddr(), shouldEmitVTableThunk(), clang::Sema::SpecialMemberIsTrivial(), clang::CodeGen::CodeGenFunction::StartFunction(), clang::CodeGen::CodeGenFunction::StartThunk(), clang::TemplateDeclInstantiator::SubstFunctionType(), clang::Sema::SubstituteExplicitTemplateArguments(), SuggestInitializationFixit(), clang::TreeTransform< Derived >::TransformFunctionTypeParams(), clang::threadSafety::SExprBuilder::translateAttrExpr(), clang::CodeGen::CGOpenMPRuntimeNVPTX::translateParameter(), clang::arcmt::trans::BlockObjCVariableTraverser::traverseBody(), tryCaptureAsConstant(), clang::Sema::tryCaptureVariable(), clang::CodeGen::CodeGenFunction::tryEmitAsConstant(), clang::CodeGen::CodeGenModule::TryEmitBaseDestructorAsAlias(), clang::CodeGen::ConstantEmitter::tryEmitForInitializer(), clang::CodeGen::ConstantEmitter::tryEmitPrivateForVarInit(), TryListConversion(), TryReferenceInit(), VariableCanNeverBeAConstantExpression(), clang::TextNodeDumper::VisitBindingDecl(), clang::ento::ExprEngine::VisitCXXCatchStmt(), clang::TextNodeDumper::VisitCXXConstructExpr(), clang::ento::ExprEngine::VisitCXXNewExpr(), clang::TextNodeDumper::VisitEnumConstantDecl(), clang::TextNodeDumper::VisitFieldDecl(), clang::TextNodeDumper::VisitFunctionDecl(), clang::ASTNodeImporter::VisitImplicitParamDecl(), clang::TextNodeDumper::VisitIndirectFieldDecl(), visitLocalsRetainedByInitializer(), clang::TextNodeDumper::VisitNonTypeTemplateParmDecl(), clang::ASTNodeImporter::VisitNonTypeTemplateParmDecl(), clang::TextNodeDumper::VisitObjCIvarDecl(), clang::TextNodeDumper::VisitOMPCapturedExprDecl(), clang::TextNodeDumper::VisitOMPDeclareReductionDecl(), clang::ASTNodeImporter::VisitParmVarDecl(), clang::consumed::ConsumedStmtVisitor::VisitParmVarDecl(), clang::TextNodeDumper::VisitUnresolvedUsingValueDecl(), clang::ASTDeclWriter::VisitValueDecl(), clang::ASTDeclWriter::VisitVarDecl(), clang::TextNodeDumper::VisitVarDecl(), clang::consumed::ConsumedStmtVisitor::VisitVarDecl(), clang::ASTDeclReader::VisitVarDeclImpl(), clang::ASTNodeImporter::VisitVarTemplateSpecializationDecl(), wasRegionOfInterestModifiedAt(), Write__ivar_list_t_initializer(), Write_RethrowObject(), and writeShouldKill(). Determine whether this symbol is weakly-imported, or declared with the weak or weak-ref attr. Definition at line 4418 of file Decl.cpp. Referenced by clang::VarDecl::checkInitIsICE(), diagnoseTautologicalComparison(), EvalPointerValueAsBool(), evaluateVarDeclInit(), IsWeakLValue(), and VariableCanNeverBeAConstantExpression(). Definition at line 648 of file Decl.h. 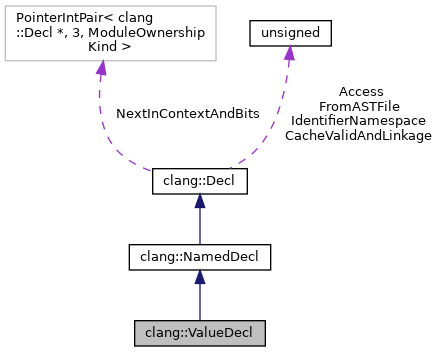 Referenced by clang::Sema::ActOnForEachDeclStmt(), clang::ASTContext::adjustDeducedFunctionResultType(), clang::Sema::AdjustDestructorExceptionSpec(), clang::ASTContext::adjustExceptionSpec(), clang::Sema::CheckEquivalentExceptionSpec(), clang::Sema::CompleteVarTemplateSpecializationDecl(), clang::Sema::DeduceVariableDeclarationType(), FinishForRangeVarDecl(), clang::TemplateDeclInstantiator::InitFunctionInstantiation(), clang::ASTDeclReader::VisitFunctionDecl(), and clang::ASTDeclReader::VisitValueDecl().